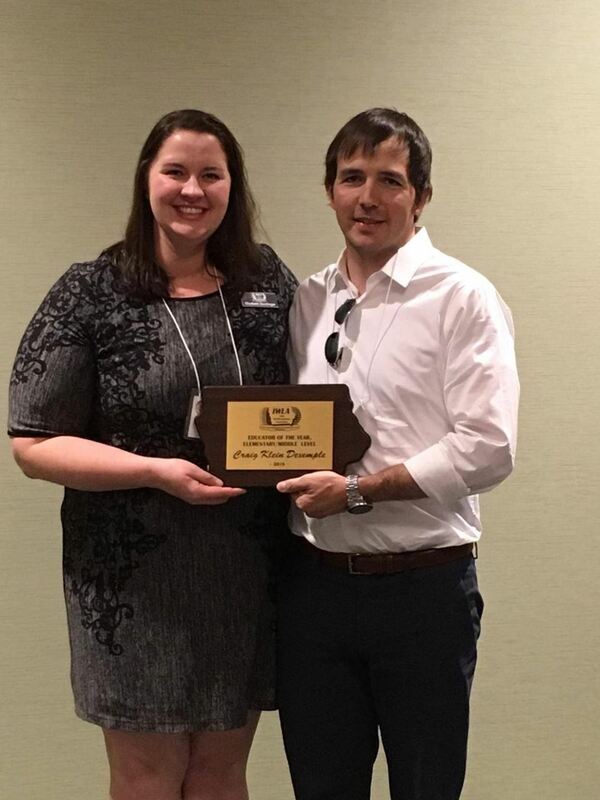 Ankeny, IA - The Iowa World Language Association (IWLA) is pleased to announce that the 2018 Teacher of Promise Award has been awarded to Katelyn Pletcher, a French language teacher at Troy Buchanan High School in Troy, Missouri. The award presentation was held during the luncheon of the 2018 Iowa World Language Association’s annual fall conference at the DMACC Ankeny Campus in Ankeny, Iowa on Saturday, October 13th, 2018. Although Katelyn now teachers in Missouri, her teacher training program at the University of Iowa is what helped her become the teacher she is today. She is described as “an energetic, engaged, clever individual who truly cares about connecting with students.” The teacher herself shared many anecdotes in her essay about students with difficult situations at home or with family and friends, but always stressed the importance of connecting to her students and trying to build a relationship with them. Please join us in congratulating Katelyn as the 2018 IWLA Teacher of Promise! 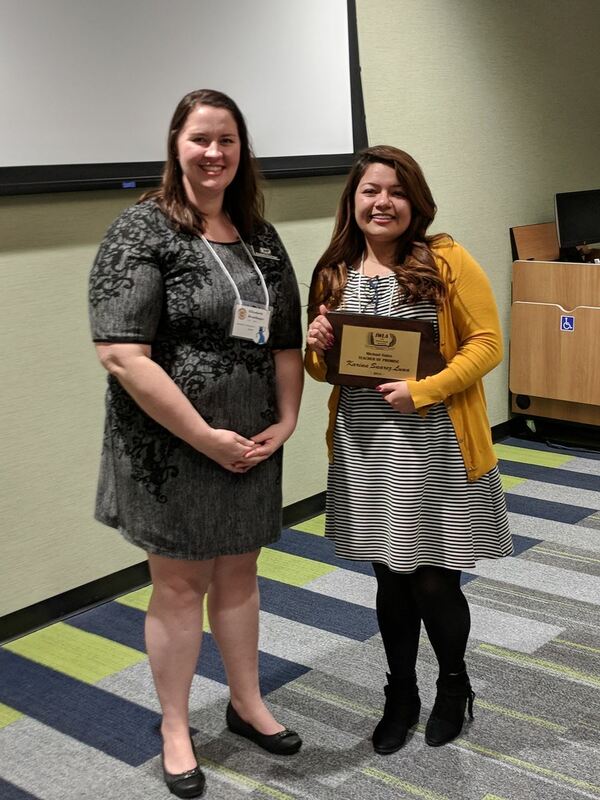 Ankeny, IA - The Iowa World Language Association (IWLA) is pleased to announce that the 2018 Teacher of Promise Award has been awarded to Karina Suarez Luna, a Spanish language teacher at Des Moines Public Schools in Des Moines, Iowa. The award presentation was held during the luncheon of the 2018 Iowa World Language Association’s annual fall conference at the DMACC Ankeny Campus in Ankeny, Iowa on Saturday, October 13th, 2018. Karina shared she knew that she wanted a be a teacher since she was 10 years old, when she began helping her English teacher with pronunciation in order to help her peers. She describes her classroom as her “home, where I provide a safe place where my kids to laugh, cry, learn and have fun.” Her nominator describes her as an amazing educator who demonstrates great strength in relating to her students. She has an impressive mastery of the Spanish language and her Mexican-American heritage make her a true asset to her students. Please join us in congratulating Karina as the 2018 IWLA Teacher of Promise! 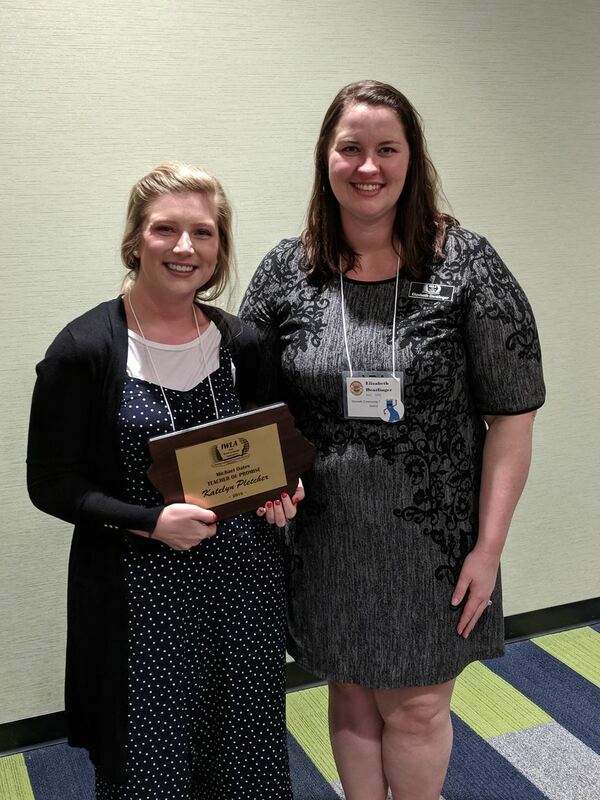 Ankeny, IA - The Iowa World Language Association (IWLA) is pleased to announce that the 2018 Best of Iowa Presentation has been awarded to Allison Wienhold, a Spanish language teacher at Dunkerton, High School in Dunkerton, Iowa. The award presentation was held during the luncheon of the 2018 Iowa World Language Association’s annual fall conference at the DMACC Ankeny Campus in Ankeny, Iowa on Saturday, October 13th, 2018. 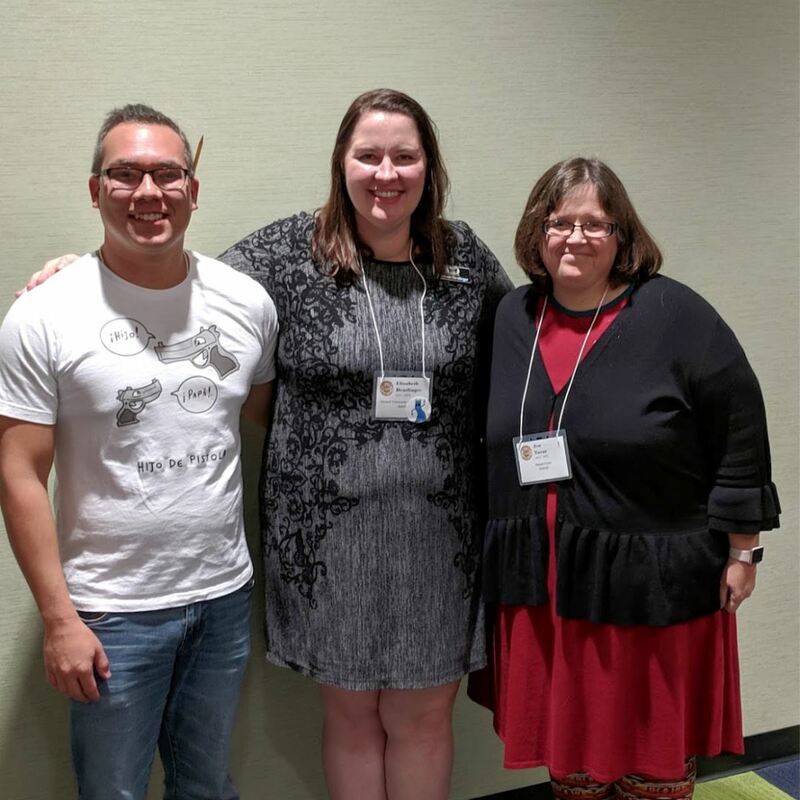 Allison currently serves the Iowa World Language Association as President-Elect, in addition to serving the world language teaching community in various capacities: blogger, presenter, and cheerleader for her peers. Allison’s presentation, titled (C)I like to move it, move it, focused on how to incorporate physical activity in the world language classroom. 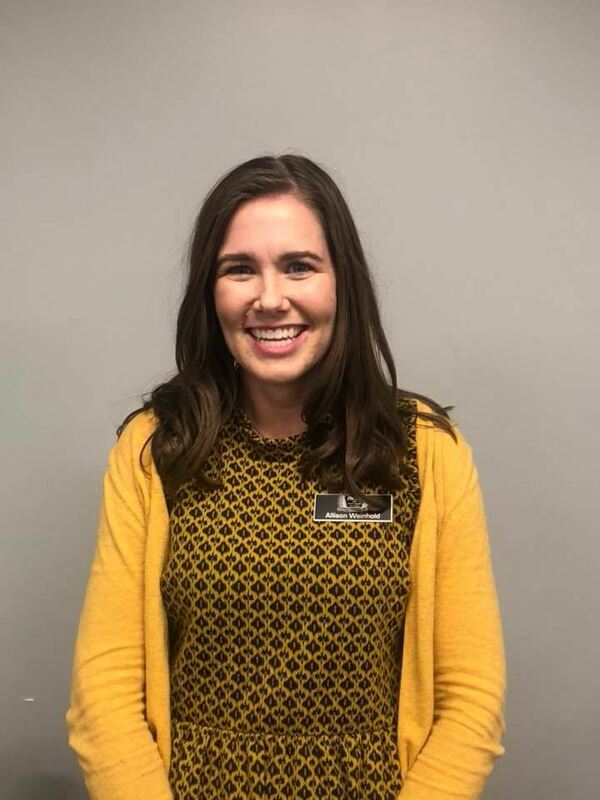 She will represent the Iowa World Language Association at the 2020 Central States Conference on the Teaching of Foreign Languages in Minneapolis, MN. Please join us in congratulating Allison Wienhold as the IWLA’s 2018 Best of Iowa Presentation winner! 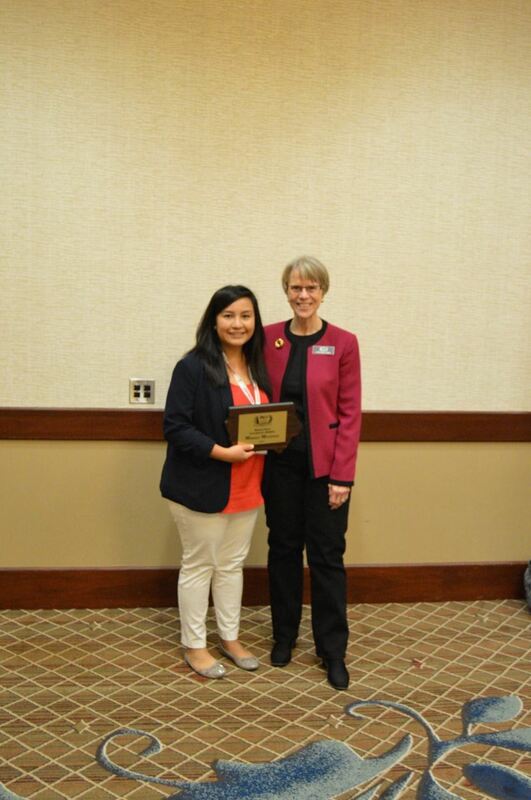 Des Moines, IA—The Iowa World Language Association (IWLA) is pleased to announce that the 2017 Distinguished Service Award has been given to Kerisa Chung Baedke, a Spanish language teacher in the Prairieview School in Waukee, Iowa. The Distinguished Service Award recognizes a world language educator who, throughout her/his career, has demonstrated professional growth; extensive involvement in IWLA and in other professional organizations; leadership; and excellence in teaching. The award presentation was held during the luncheon of the 2017 Iowa World Language Association Annual Conference at the Des Moines Downtown Marriott in Des Moines, IA on Friday, October 13th. Des Moines, IA—The Iowa World Language Association (IWLA) is pleased to announce that the 2017 Educator of the Year (Secondary Level) Award has been given to Kimberly Huegerich, a Spanish language teacher at Nevada High School in Nevada, Iowa. The Educator of the Year Award is designed to recognize teachers who exemplify the best in teaching at their particular level, who demonstrate involvement in the Iowa World Language Association, and who provide evidence of leadership and contributions to the field of world language education. The award presentation was held during the luncheon of the 2017 Iowa World Language Association Annual Conference at the Des Moines Downtown Marriott in Des Moines, IA on Friday, October 13th. Ms. Huegerich’s resume reveals an amazing depth of knowledge about teaching language in modern times - it shows her expertise in technology, in directing conferences for language teachers, in presenting at conferences on a variety of topics, and in mentoring new teachers. She has been a four-year IWLA Executive Board member and served as president of IWLA, and has served in multiple other positions in language teaching organizations. 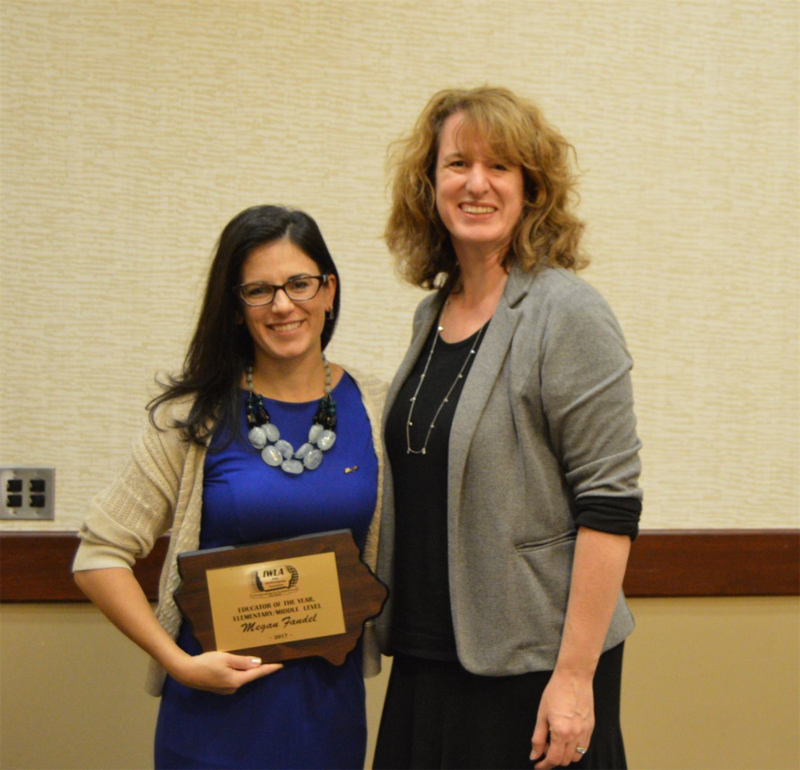 Des Moines, IA—The Iowa World Language Association (IWLA) is pleased to announce that the 2017 Educator of the Year (Elementary/Middle School Level) Award has been given to Megan Fandel, a Spanish language teacher in the Van Meter Community School District, Van Meter, Iowa. The Educator of the Year Award is designed to recognize teachers who exemplify the best in teaching at their particular level, who demonstrate involvement in the Iowa World Language Association, and who provide evidence of leadership and contributions to the field of world language education. The award presentation was held during the luncheon of the 2017 Iowa World Language Association Annual Conference at the Des Moines Downtown Marriott in Des Moines, IA on Friday, October 13th. Ms. Fandel has presented at the IWLA conference every year for four years, and, as her principal states, she is a leader in emphasizing the importance of comprehensible input in the classroom. 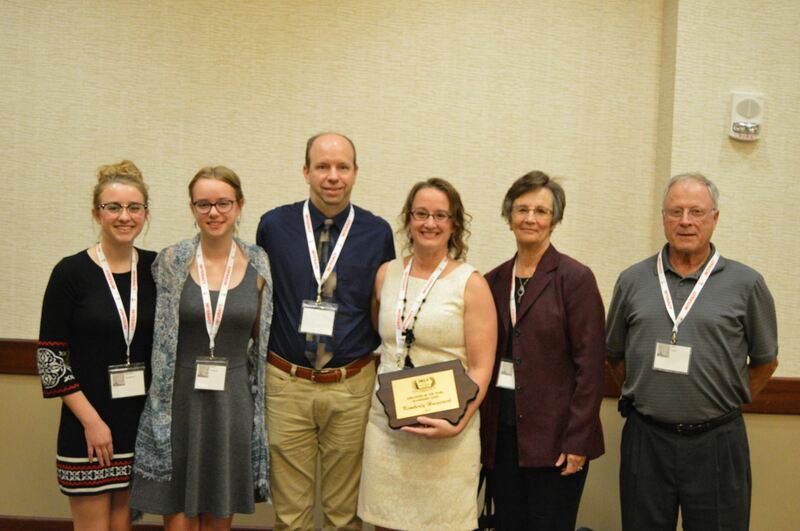 Des Moines, IA—The Iowa World Language Association (IWLA) is pleased to announce that the 2017 Michael Oates Teacher of Promise Award has been given to Elizabeth Schupp, a German language teacher at Timberline School in Waukee, IA. This award is conferred annually on students in teacher training programs or in early stages of their careers who have shown exceptional promise and potential to become outstanding world language educators. The award presentation was held during the luncheon of the 2017 Iowa World Language Association Annual Conference at the Des Moines Downtown Marriott in Des Moines, IA on Friday, October 13th. Ms. Schupp has studied music in Austria, taught English in Spain, and traveled extensively in Germany. It is clear that in all of her travels, she has been an ambassador for crosscultural understanding and helping young people to see the utility of learning languages. As her nominator said in the nomination letter, “She is a proud advocate for the German language, and she has thought through many ways to help students and community members to see how relevant it is.” One of her colleagues said that her influence at the school has made students start to use “Frau” to refer to many of their non-German teachers. As a German teacher, she looks forward to, as she said in her statement, “a long career growing strong language programs and impacting students’ lives.” We are lucky to have her in our community of language teachers in Iowa.